The page on the other side of this only has five videos on it. But just two of them individually are worth the price of a password. 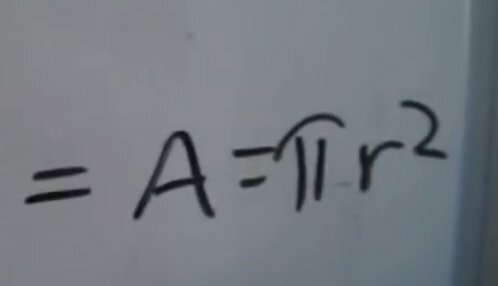 This derivation of πr² is rarely taught to students, or even to teachers. Most of the time when I show this to teachers they have never seen it. I have never shown this to a student who had already seen it in 25 years of doing this. I need to make a more step by step video showing all the different things you need to do to get to this point but for now these short vids will have to do. The few minutes you spend here may well clear up a lot of confusion and give you a few "a-ha" moments. If you are a teacher these vids should give you a few ideas. I have taught this to 3rd graders without much difficulty, but as the video says it will take you hours of preparation to get here. I also put a bonus video on the page, from a guy who makes videos on YouTube that have animations That very much resemble based 10 blocks. He mentions several times in his video series that a good way to visualize multiplication is by thinking about area. He also shows you the derivation of πr² with cool animation. His derivation is completely different than mine. I've always said you should know how to do something more than one way. On the next page you get two great explanations that should help you attain greater understanding...And get you ready for calculus.